The modern sword, machetes are a multi-use tool that can seriously come in handy out in the wilderness. Whether you need to defend yourself, cut something down, or chop something up, the Black Steel Bush Machete is the tool to use! 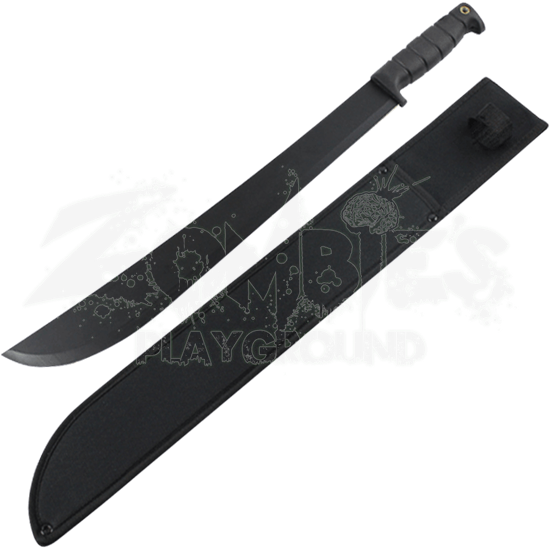 This bush style machete consists of a black, stainless-steel blade and a durable, ABS plastic handle. This evenly weighted steel blade is designed for a wide number of purposes, making it extremely useful to have around a campsite or hunting lodge. The black nylon sheath it comes with is stitched for durability and features a loop to secure the handle with and a belt loop for easy carry. Take the Black Steel Bush Machete with you on your next hunting or camping trip and be prepared, or give it to a hunter or camper you know as a useful gift!